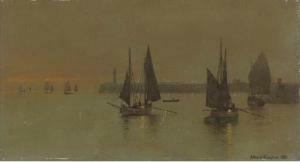 Find artworks, auction results, sale prices and pictures of Arthur Edmund Grimshaw at auctions worldwide. 28 by 46cm. ; 11 by 18in. Footnote: See illustration The Grimshaw family used furniture, paintings and objects as props in their paintings. 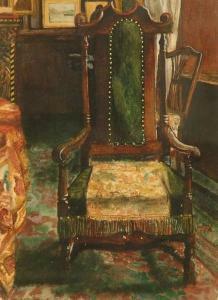 This is the same chair used by Atkinson Grimshaw in the painting Dolce Domum, painted at Knostrop Hall, Leeds. An unfinished watercolour study of Elaine Grimshaw sitting in this chair by Arthur is in the Leeds City Library Local History Archives. 18 by 30.5 cm., 7 by 12 in. signed and dated l.l. 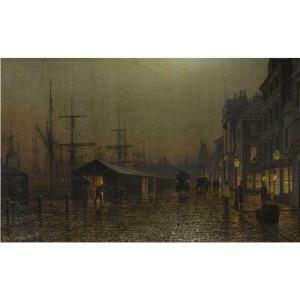 : Arthur E. Grimshaw. 1894. John Atkinson Grimshaw named his five children after charactersfrom Tennyson's Idylls of the King, Enid, Gertrude, Elaine,Lancelot and Arthur. 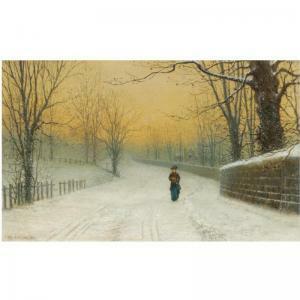 Arthur Grimshaw was born in 1868 and like hisfather, he painted moonlit scenes of deserted streets and docks andevocative snow scenes in and around north Yorkshire. Little isknown about Arthur's life and it is likely that he only painted fora short time between 1890 and 1900 when he gave up painting toconcentrate on a career as a musician, as the organist at the RomanCatholic Church in Leeds. The present picture depicts a scene thathis father painted on several occasions in the 1880s, includingAutumn Sunshine, Stapleton Park, Pontefract (Christie's, 8 June2006, lot 207). Arthur imposed his own mark upon a scene that JohnAtkinson had painted so often, by cladding the street in snow,glistening on the branches of the trees and gathered on theimpenetrable wall. Only the wheels of the last homeward-bound cartsand the feet of an elegantly dressed lady in furs and carrying amuffler against the cold, leave their impressions in the snow. Son of John Atkinson Grimshaw, Arthur trained as a musician and was organist and choirmaster of St Anne's Roman Catholic Cathedral in Leeds from 1883. Later in the decade he composed various songs, part-songs and melodies for string orchestra. 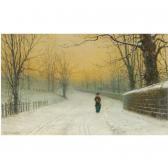 Son of the artist John Atkinson Grimshaw, Arthur was influenced by his father's style and choice of subject matter. His paintings focus on the streets and dockland areas of Northern cities and towns: Glasgow, Liverpool, Leeds and Scarborough. He was most active between 1890-1900. Unlike his father, he is not known to have exhibited at the Royal Academy. 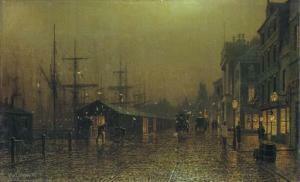 Prior to his forays into painting, Arthur Grimshaw had directed his interests towards other artistic fields. Trained as a musician, he was organist and choirmaster of St. Anne's Roman Catholic Cathedral, Leeds, from 1883. Active in this field, he composed not only a setting for Psalm 141 and other Church music, but two operettas, El Escribano and Amaranthus, in 1891 and 1892 respectively. Later in the decade he composed various songs, part-songs and melodies for string orchestra. We are grateful to Alex Robertson for his help in preparing this catalogue entry.